If you read Part 1 of ordering this early 90's Fender Japan ST72-80SC Yngwie Malmsteen Stratocaster from Ishibashi's U-Box, I mentioned that I would be peering under the hood for a peek at the pickups and internal electronics. In Part 1, I also mentioned that I would be installing KTS Titanium Saddles. Which didn't go too well as I'll detail later. 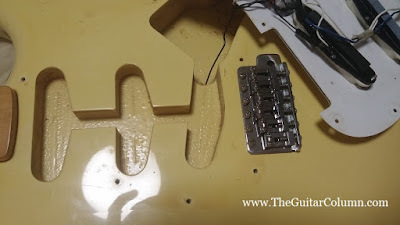 Taking a Strat's pickguard off to check for cracks in the body wood is something I have been doing since buying my very first Stratocaster on 1989. I had returned home in the evening after a day of guitar shopping and was plugging in my new pride and joy, a black, rosewood-neck Japanese Fender Stratocaster into my 60-watt Ibanez IBZ amplifier. It sounded great as I put it through its paces and explored its different tones while 'Good Morning Vietnam' was showing on TV. But over Robin Williams' histrionic dark humor, something told me to take a look under the pickguard. And lo and behold, there was a huge break in the wood where the neck pocket meets the front pickup. The bare wood was visible through the black finish. 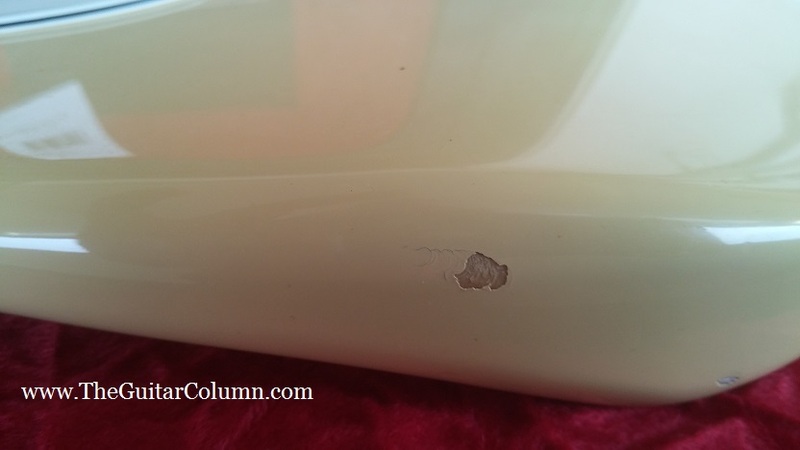 It was as if someone had dropped the guitar head first, which would have also left a huge dent in the headstock at the very least. Oddly enough, there wasn't a single mark. What made me look under the pickguard? It was just one of those things -- something I can't explain to this day. And somehow, that memory still haunts me whenever I buy a new Strat-type guitar. And checking under the pickguard of any bolt-on guitar I might buy, regardless of manufacturer, has become a ritual of sorts. 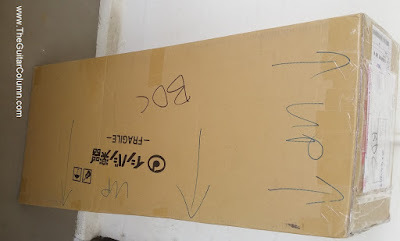 The happy ending to this story was that I brought the guitar back to the store the next day, expecting to show the damage to the store's owner and have to explain that the guitar was already damaged when I bought it. Surprisingly, he didn't even ask to look at the guitar but offered me an immediate exchange. 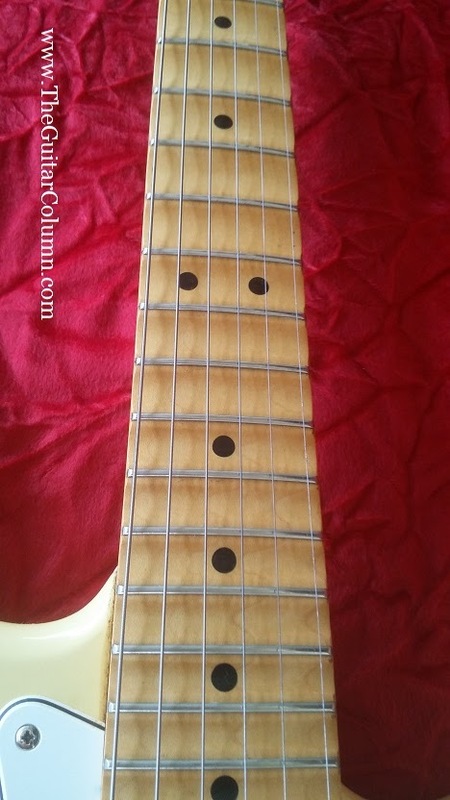 I asked how much a Fender American Standard would cost -- four extra bills -- and went with one of those, a black Strat with a rosewood fingerboard. The store owner fetched it himself from the storeroom, the guitar in a molded black Fender ABS hardcase, still in the factory sealed cardboard carton. I offered to open up the carton myself and had to ask for a pair of pliers to remove the large brass staples. I didn't even have to try another American Standard to compare it with. It just felt right and it definitely had that Hendrix at Monterey vibe. That black American Standard Stratocaster became my main workhorse instrument for many years and is a guitar I still own. Some things are just meant to be, I guess. But back to my latest acquisition. After cutting the strings off the ST72-80SC, I proceeded to remove the eleven pickguard screws, which I noticed, were brand new. I'm guessing the old screws were replaced as a courtesy by the good folks at the Ishibashi setup department since 20-something year old nickel-plated screws would be seriously tarnished with rust, grime and who knows what else. Popping the pickguard off, I noticed no splits, cracks or breaks in the wood -- phew. 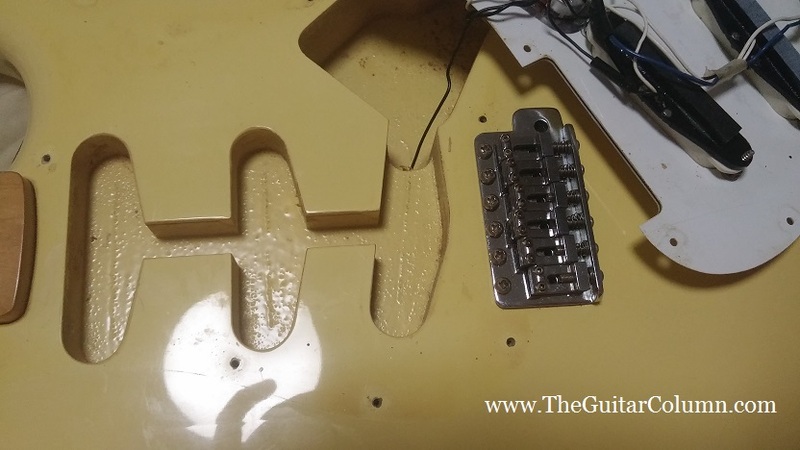 I also noticed that despite the pickguard having been on for two decades, the paintwork underneath was the same shade of yellow cream as the rest of the body. I was expecting a 'shadowing', where the paint under the guard would be a much lighter color than the rest of the body that was exposed to light for 20 years. Interesting. But I was most curious about the pickups. 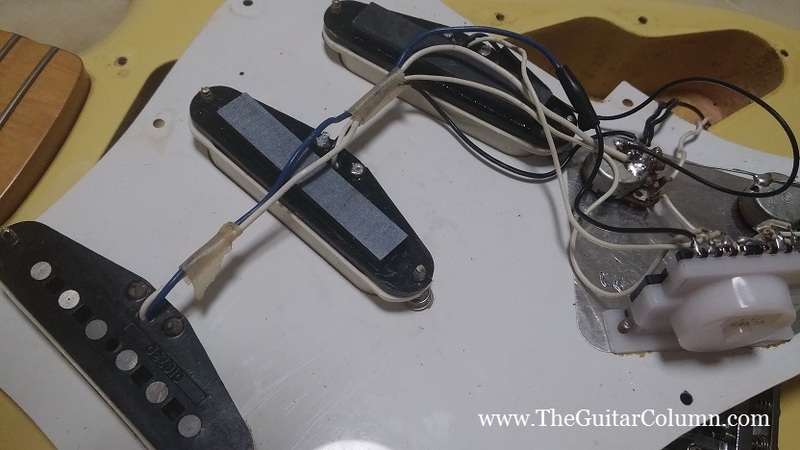 Johan Lindh at Ishibashi informed me that the front pickup had been exchanged for a Fender USA model number 016730. 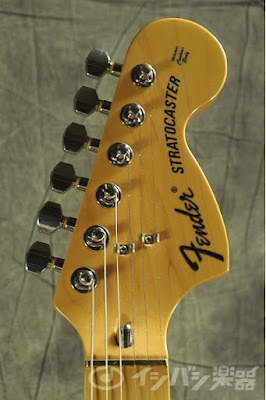 Which turned out not to be a model number at all, but a part code one of Fender's pickup bobbin suppliers used. Part number 016730 can be found stamped underneath the stock vintage-wound pickups used on many Fender USA and Mexico models. Fender Japan's brochure from the '90s lists the pickups supplied with the ST72-80SC as 'ST-Current'. 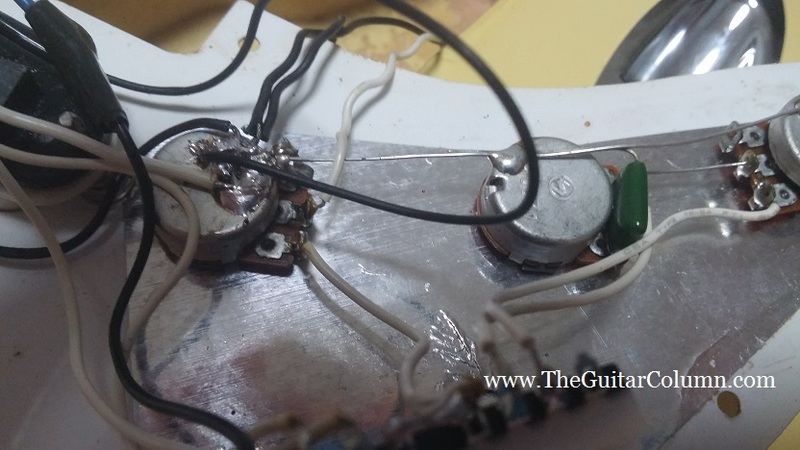 Note the additional magnet under each ST-Current pickup in the middle and bridge positions. Not your typical stacked single-coil configuration. And they sound pretty good -- a little higher output than regular single-coils, but without the screechiness especially at the bridge. DiMarzio HS-3 pickups, Yngwie's personal choice at the time, came standard on model ST72-950SC in the bridge and neck positions. The ST72-950SC is identical to the ST72-80SC in specifications except for the pickups. The wiring on the ST72-80SC features Japanese-made Alpha potentiometers, ubiquitous green capacitor and typical cheapo plastic 5-way switch. No fancy cloth-covered vintage wire here. If you ask me, even the soldering is a little sloppy. Perfectly functional, but I might upgrade the circuitry at a later point with a CRL 5-way switch, Bourns 250k pots and a nice paper-in-oil capacitor. And yes, some braided cloth-covered wire, just for kicks. 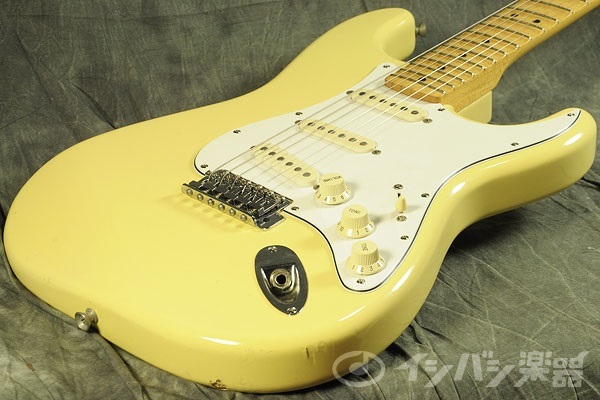 I found out that the Fender Japan ST72-80SC and ST72-950SC were not official Malmsteen models -- hence the absence of Yngwie's signature at the headstock. Although the US-made Fender Yngwie Malmsteen model had already been around for a few years, Fender Japan had yet to strike up a deal with the Swedish maestro and were producing these unofficial Malmsteen models for sale in Japan's domestic market only. 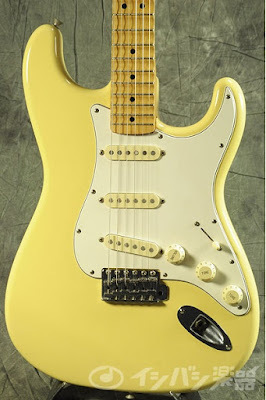 And the best part is that they were more like Yngwie's famous 'Duck - Play Loud' 70's Stratocaster, than the American Standard-style Strats that passed for the official Malmsteen signature model at the time. 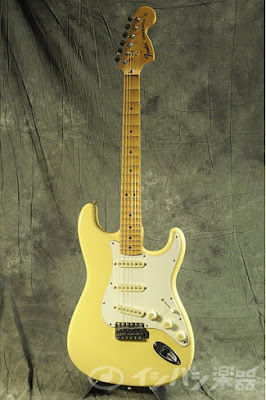 An unofficial Ritchie Blackmore model, the asymmetrically scalloped ST72-75SC was also available at the time, decades before the current Mexican-made Fender Blackmore signature. No surprise really, seeing as how popular both Messrs Blackmore and Malmsteen were in Japan. 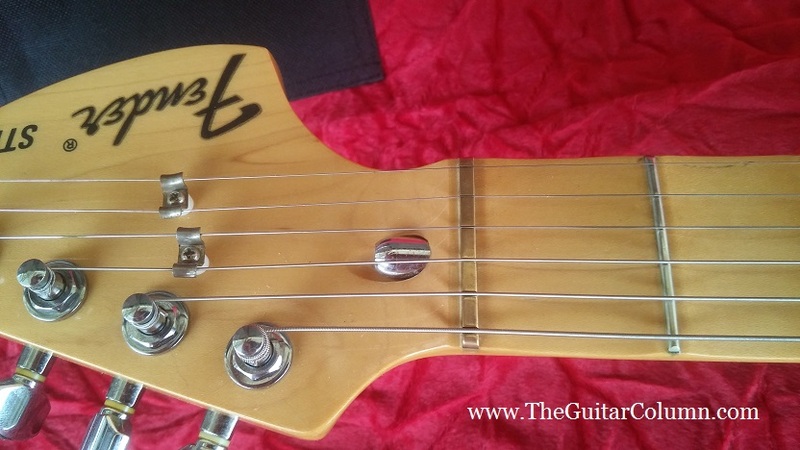 Speaking of scalloping, the ST72-80SC is not as evenly scalloped as the current USA Yngwie signature models. 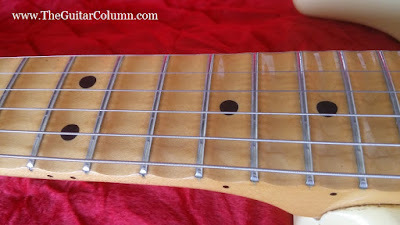 Fender Japan seems to have played it a little safe and the scallop starts about 1mm after the fret, leaving each fret on a slight ledge. Not a bad thing really, it's just something I noticed when taking these pictures up close. And since each fret is on its own ledge, it might actually be easier to refret should I ever need to. I also noticed that this guitar has an unusually thin finish for a Japanese instrument. The ding you see in the picture below -- one of several -- shows the thinness of the urethane finish against the bare wood underneath. Most polyurethane finishes render the guitar almost bullet-proof. A ding to the bare wood shows how thin this finish actually is. And about those KTS Titanium saddles.. These KTS saddles were a gift to me some years ago by a good friend of mine, but I never had a Strat lying around that needed a saddle replacement. I'd always been a GraphTech guy and would replace the stock bent steel or diecast saddles on a newly acquired Strat as a matter of course. When this guitar arrived I immediately thought of replacing the die-cast saddles with the KTS Titanium saddles at the next string change. 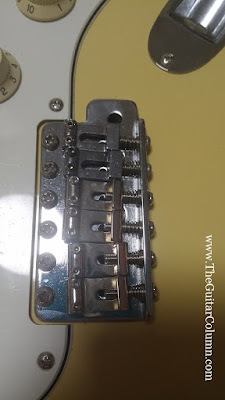 I had never experienced playing a Strat with titanium saddles and I was definitely curious as to how differently the guitar would feel and respond. But I made sure to bring the guitar with its stock die-cast saddles to my usual Monday night gig first so I would have at least some remote frame of reference for tonal comparison later. Things looked rosy as I removed each die-cast saddle and replaced it with a KTS saddle. I had replaced the saddles for the low E, A, D and G strings when I started noticing a problem. Instead of lining up in a straight row, I could see that the saddles were starting to fan out in an arc. The KTS saddles I had were too wide for this Japanese bridge! 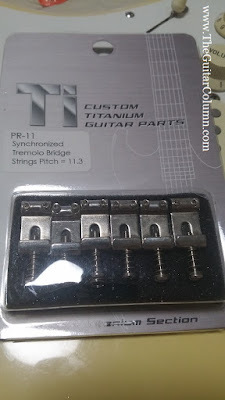 Browsing the KTS site, I realized that the KTS saddles I had were from their PR-11 set which fit American and Mexican Fender bridges. 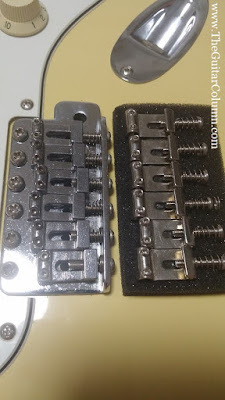 The bridge that came with the ST72-80SC, probably made by Gotoh for Fender Japan, required the narrower saddles from the KTS PR-04 set. Nothing to do then but to put the old die-cast saddles back on. I used the different hex screw heights on each saddle to determine their original order on the bridge and also so I wouldn't have to do a massive readjustment re-setting the saddle heights. Stay tuned for Part 3 where I will upgrade the electronics and pickups on the ST72-80SC.